In a return engagement in New York from Kyoto, the active crystal singing bowl player and pianist, Naoe Moriya will perform in Manhattan for the first time in four months. In this concert, she will express “Harmony” by bringing the sound of Kyoto and blending it with the sounds of metropolitan New York. Please come out and enjoy the healing sounds of her Crystal Healing Bowl and feel the serenity and joyfulness of her original compositions. Naoe has a certificate in International Dalcroze Eurhythmics Teaching from the Juilliard School’s, after graduating from Kunitachi College of Music in Japan. She is an artist of many musical talents: voice, composer, improvisation, piano, and crystal singing bowls which are made of crystal and used in healing sessions. Using her experience as a musician, Naoe established her own performance style as she now plays crystal singing bowls and piano together. She has performed throughout her home country of Japan and numerous times in New York, Hawaii, San Francisco, Shasta, and Sedona. Naoe is also a Certified Reiki master & NLP (coaching and practicing psychology) trainer. The crystal of these bowls emits two big and powerful kinds of energy: relaxation and purification. They provide help with sleeping, blood circulation, and the adjustment of Chakras. Zai 在 – a theatrical entertainment show to explore your 7 chakras through music, dance, color and visuals. A multisensory appeal to your emotions, an active meditation and performance. Inspired by the practice of sound healing this improvised performance and will exist only in this moment. There is no future, no past, there is only now. By living in the moment, we can more deeply appreciate life and enjoy what we truly are. Love your strengths and embrace your weaknesses. Naoe Moriya will play crystal singing bowls and piano at Hawaiian Queens Coffee Garden. Her music will be accompanied by a dance performance by Nahoko Sugiyama coming from New York. Drinks and sweets will be served. We held ATOWA concert last Saturday night. I really appreciate to the people who came to our concert and the people who helped us. “ATOWA” means the universe and the earth. It was duo concert that I performed with my friends, Saco. I was able to acknowledge this again at the concert. Saco played the piano and sang expressing the ground and I played the piano, crystal bowl and sang expressing the sounds from the universe. Nahoko’s dancing absolutely connected our sounds. Also we improvised many times and I played crystal bowls around 20 minutes for healing time. I think everybody enjoyed our concert. After the concert, everyone was smiling were than before the concert. I think that everyone felt united from the music. I hope to come back to New York and play again! I held The Crystal bowl& Piano Spring Concert last Sunday night. It was my first time organizing a concert in NYC. I’m really thankful to my friends who supported me. It was so hard to gather people to come my concert until 2weeks before that day. But finally, many people came to my concert! When I was about to crumble under the pressure of organizing this kind of event, my friends helped me a lot. I could overcome this hard period. I got through it with the help of my friends. I felt people’s warm hearts at this time. They enjoyed and were excited to talk about my concert. People’s interest kept getting more intense and the concert hall was full of people and warmth on the day of the concert.. I stood on the shoulders of many friends. When I arrived at the hall on my concert day, my few friends had already gotten there and were helping me set up for it. A big camcorder was set up at the back of the hall, because my friend suddenly decided to come to my concert to take video. I could concentrate on setting up my crystal bowls. Setting up everything correctly is the most important thing because I played the crystal bowls and piano at the same time. I put my crystal bowls on the table beside the piano, and sat on the piano bench. I adjusted everything many times and found the best place to play both instruments. And the concert started on time. First, I played only the crystal bowls for a few minuets to pray for the victims in Kyushu, which is in a southern area of Japan because a huge earthquake struck that area last week. And then, I moved my hands to the first bowl. I never decide which bowl to play first. I always go with the flow. I concentrate and all my feeling mix together, my body feels free. I play the first tone at that moment. I play what I am feeling and go with the flow. I played each tone as if it were my last. I’m free to play whatever I want; I just have to feel the energy of the space and people. I always open my heart while I play. I’m comfortable when I am performing. I think these things work for making music together. The people who came to my concert said that they felt everything, everybody felt connected at my concert. I could feel the same thing, too. Thank you for coming to my concert. I will continue to make songs everyone to enjoy. I play crystal bowls and piano together. The reason why I wanted to play together is I wanted many people to know crystal bowls’ sounds which are pure and beautiful. The first time I listened to the crystal bowl, I was surprised that the sound came inside of my body as if I had drunk something. After that moment, I felt the sound expand throughout my body. The crystal bowls emit two big kind of energy which are relaxation and purification. If you listen to this sound, your body and mind become lighter and you want to do new things. You feel yourself become a positive person. If I tell the history of my life, piano is indispensable for me. Unfortunately, my hands are so small,so I thought I couldn’t be a pianist. I longed for piano, but even though I had caught it, I still could’t reach it. The situation was changed by the crystal bowl. Crystal bowls are good even though they only play one sounds. However , I know music is well loved and if people play music, their feelings are changed by it. So if I play crystal bowls, I always play a melody instead of only sounds. It was challenging for me, because the crystal bowl’s and piano’s sound quality are much different even though both are percussion. Imagine a couple meeting for the first time,they are very nervous to know each other, but little by little they become accustomed to each other and they grow closer. Now, think about piano and crystal bowls. They are definitely not the same sound quality,but if I play them together, they want to be together and finally they make good harmony. Our body has a frequency and all things in the world have their own frequency. If we imagine the waves in the sea, there are many kinds of waves. When two waves meet from different directions, they combine and create a new frequency. This is the same for music. If we listen to music and the sounds come close to our bodies, the frequencies from the music and ourselves meet and combine in the same way as waves in the sea. “I felt as if I was in heaven.” Many people who attended in my concert said comments like this. I’ll give you the ultimate healing and relaxation space at my concert. I’ll give my all to my music when I play. Please come and enjoy it! *All profits will be donated to fund relief effortsfor those affected by the 2011 earthquake in Japan. *If you would like, feel free to bring a yoga mat or a bath towel to lie on and a blanket to cover up with during the performance. I would like people to feel as comfortable as possible while lying on the floor. I uploaded the song “Star Prayer” to Youtube. This song is The memorial song for the 2011 huge earthquake in Japan. Please take look at here! Spring is coming to New York City. How would you like to welcome the spring? Are you looking forward to the coming spring? I’m going to hold a crystal bowl & piano concert in Manhattan,New York City on April 17th. The theme of this concert is just ‘ Spring ’ ! I’m very excited to prepare for the concert. I’m going to play a special song for spring. Please participate and enjoy my songs! for those affected by the 2011 earthquake in Japan. while lying on the floor. Naoe was accredited as a certified International Dalcroze Eurhythmics teacher from the Juilliard School in NYC after graduating from the Kunitachi College of Music in Japan. She is an artist of many talents as she plays the piano, sings, composes, improvises and teaches music. She is also a crystal bowl performer. The crystal bowl is an instrument made of crystal and is used in healing sessions. 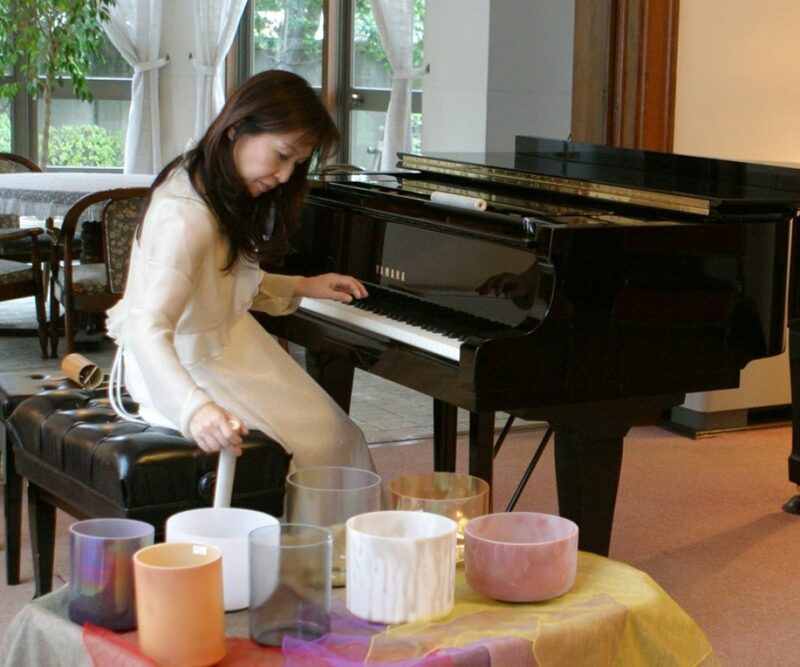 Using her experience as a musician, Naoe established her own performance style through playing the crystal bowls and the piano at the same time. This novel approach blurs the lines between music and healing sounds and creates a unique experience for listeners. In addition, she is a Reiki master and an NLP (Neuro Linguistic Programming) trainer. She has performed all throughout her home country of Japan and numerous times in New York, Hawaii ,Sedona, San Francisco and so on. The crystal found in this special instrument emits two big and powerful kinds of energy: relaxation and purification. Almost five years have passed since the huge earthquake in Tohoku Japan. My Japanese friend Kazuko Takebayashi, who is a singer, is producing a memorial concert on March 11th. The concert is going to be broadcast by Ustream around the world, so I‘m going to participate from New York and play crystal bowls and piano. Please access it through the URL below, enjoy the concert and pray for a lasting peace together. Kazuko will sing a few songs at the concert. You will definitely enjoy her performance. I t is snow in New York area today. I remenber the coldest weekend in New York city in last month. I’m going to tell about it. The wind chill temperature was minus 16 degrees. The New York Mayor said to please stay home on TV. I couldn’t feel the temperature exactly because my room was warm. I was confused about if it was true or not. I tried going outside because I wanted to know the truth. I regretted this attempt as soon as I went out from my apartment entrance. I stopped walking and came back inside immediately. I remembered to reserve a hair appointment that day, so I pulled myself together, and went outside again. I was a little nervous because it was my first time going to the hair salon. It is easy for me to lose my way if I go to a new place. The person who cut my hair was so nice, so I enjoyed talking with her. She said, “ I want to hang a towel outside. I will make the towel wet first, then go outside with it, steer it quickly and squeeze it. Maybe I will be able to make a standing tower like a sword. I posted this story on Facebook, some of my friends commented to me that I should try it! I succeeded in making it! It was so amazing, wasn’t it?